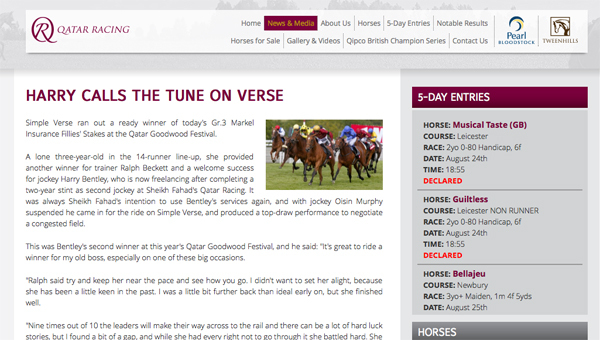 Simple Verse ran out a ready winner of today’s Gr.3 Markel Insurance Fillies’ Stakes at the Qatar Goodwood Festival. A lone three-year-old in the 14-runner line-up, she provided another winner for trainer Ralph Beckett and a welcome success for jockey Harry Bentley, who is now freelancing after completing a two-year stint as second jockey at Sheikh Fahad’s Qatar Racing. It was always Sheikh Fahad’s intention to use Bentley’s services again, and with jockey Oisin Murphy suspended he came in for the ride on Simple Verse, and produced a top-draw performance to negotiate a congested field.